Your website is one of the first places your potential customer or client will go to learn more about you. From the Home page to the Contact page, the content across your site has a direct impact on your leads. The copy should be compelling, easy to digest and informative. Sounds pretty straightforward, right? But easy? Not always. We’re here to tell you that writing website content is just as much strategy as it is words. All you need is a bit of confidence, a keyboard and a handful of tips to get you started. Not everyone can be Shakespeare. Thank goodness for that, too! Because while your website is critical to your business, it doesn’t need to be an epic novel or the latest New York Times Best Seller. In fact, it ought to be much simpler than that. Your website content’s main job is to connect with your audience in a way that makes them want more of you. So, how do you that? If you’ve never written anything like this before, know that writing takes some practice. Don’t make writing your content more complicated than it is. Start small by writing one page at a time—heck, one paragraph a time—just to get your ideas down first. Then you can start fleshing it out. Don’t try to get fancy—get the basic information down before you do anything else. Write in your own voice and don’t try to sound like someone else or over-flourish. Your audience is looking to learn more about you and what makes you unique. They want to connect with you—make it easy for them by being your authentic self from the start. Your website content should exist to serve your audience. Think about your business and what your audience is looking for when they visit your website. What kind of content will fill their need? What can you say to solve their problem? Frame your website content in this way and you’ll never be at a loss for words. It can be hard to write without a plan. Take a few minutes to think about the goal of your content and brainstorm some ways you can meet that goal. Next, create a quick outline for your site and then for each page. Then begin filling in your outline with your thoughts, building your copy step-by-step as you go. Want help with this step-by-step process? 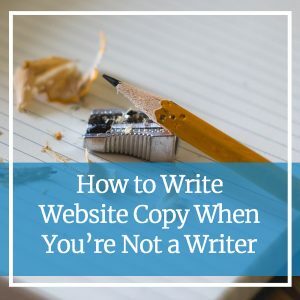 Sign up to join Write That Site, an online course that teaches you everything you need to write your website yourself. Learn More About Write That Site! Sometimes, as a business owner, it’s tough to find time to do it all yourself. If your website copy is causing you stress, it’s best to reach out for help. A professional copywriter can turn your ideas, goals and unique voice into web copy that delivers. Need Help? Contact Our Website Copywriters Today! Although words are hard, having a professional website doesn’t have to be. Let us help you write a website you’ll be proud of. Reach out to our team by calling 612-643-1824 or send us a quick message online!